Very few people walk out of a car dealership happy. The same is true of boat, truck, motorcycle and various other dealerships. After viewing an ad in the paper, you arrive at the dealership only to be told that the car you were looking for has already been sold, is buried ten cars deep in the lot or any number of excuses. Explaining that that was the most basic model, the salesperson steers you toward a vehicle that would be “better suited” to your needs at a “moderate increase” in cost. Or once you are in the negotiation process, you spend the next six or more hours of your life in Dante’s Inferno, descending from one level of hell to the next, being passed on from one salesperson to another, to their manager, all in attempt to wear you out physically and emotionally until you sign on the dotted line. These are called the bait and switch approach and the limited authority strategy. The auto industry has shot itself in the foot by continuing to use them. Each of these types of dealerships has run on the same business model and followed these same strategies since their inception to the point where the damage done to their reputations has become a stereotype. While we are not saying that all dealerships are negative or underhanded, it has come to the point where enough dealerships have used these methods that people walk into one believing that they are going to get screwed. This is a very strong mentality for a customer who has most likely never interacted with your dealership personally. While there are plenty of dealerships that operate in this fashion, and numerous people that may have even experienced it first hand, it is a persistent stereotype that reputable dealerships are constantly trying to combat. Consider the fact that the majority of people are more likely to leave a negative review for a negative experience as opposed to a positive review for a positive experience. Combine this with the fact that people walk in already expecting to get ripped off and you hopefully begin to realize the delicate situation that affects your dealership’s online reputation. Open your browser, go to Google and search for any dealership. If their ratings have more than three out of five stars, then kudos to them. However, be sure to take note of how rarely that occurs. 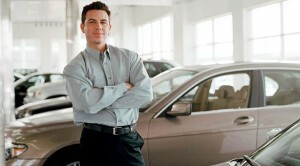 Even reputable dealerships have come to be affected by the poor business practices of others. While fixing this perception of the industry over the long term requires a complete overhaul of the business model, there are certain steps that can be taken to promote positive reviews and discourage negative ones for your own dealership. 1. Do not lie. Do not bait. Do not switch. It starts that simply. Conducting business in this manner is sure to drive away potential customers and hurt your profits. Make sure that your sales representatives are well trained and that your company is run in an ethical manner. The face of your company is that of your sales personnel. Ensuring their proper training and conduct before they step onto the sales floor can do a lot to improve the impression people get of your dealership, and consequently its reputation. Continuing to play into the stereotype will only result in negative reviews, complaints and the continued bad reputation for you and this industry. Surprise people by offering them what they wanted but didn’t expect (remember that they were expecting to get bullied and manipulated). The bait and switch approach can have a terrible impact on your customer’s perception of how you conduct business and therefore their reviews. People who have been party to this approach will warn others away from your dealership. The limited authority approach leaves people feeling frazzled, angry and confused. No matter what the end result is, they will walk away believing that they got screwed and share their experience on third party sites. This can decrease your number of prospective customers because people will assume that you will pull the same stunt with them. People will go to great lengths to avoid getting themselves in such situations. There are people who can afford to buy a brand new car that never will because they are intimidated by the sales strategies used at dealerships. Hire one person with a flat, non-commissioned annual salary. The person in this position should be given the title “Customer Satisfaction Manager,” or a similar title that exposes the fact that their presence is solely for the customer’s benefit. Their job would be to introduce themselves to every single person before they walk off the lot and to hand them a business card with their name and personal phone number with the instruction to call them if they have any questions or concerns. Also, it would be a great idea to encourage customers who have had a great experience to leave a positive review with Google Local or Yelp. Incentives such as a free oil change for a year or a simple gift go a long way in terms of getting customers to review their experiences. Remember, people are much less likely to share their positive experiences. Therefore, this process becomes critical in controlling your reputation on online review sites. Even though a dispute may not be resolved one hundred percent in a buyer’s favor, people will feel more safe and comfortable doing business with your dealership if there is someone they can contact at any time to address their questions and concerns. If you have an avenue for people to vent their frustrations or fears, it becomes much easier to funnel the negative comments through your company and to handle the situation accordingly. In this way you have a real person who will be your first line of defense against damaging online negative reviews. In addition, it gives you a golden opportunity to turn a negative into a positive. It lowers your chance for negative reviews and takes the discussion out of the public arena where you can sincerely address your customer’s dilemmas. This is at the crux of effective reputation management. Car dealerships have no idea how much business they stand to lose to poor customer reviews. There are people who can afford to buy a brand new car that refuse to do so because the sales process intimidates them, as it currently exists. For more information or a free consultation on how we can help you with your reputation management, contact us today!